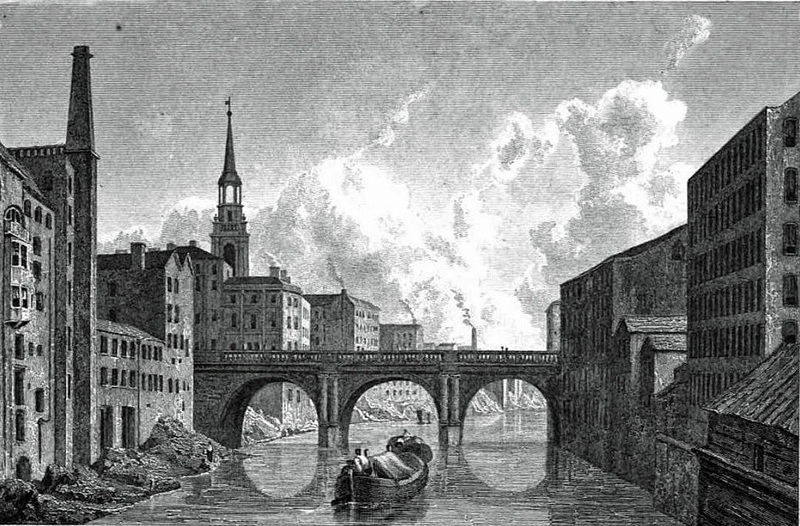 Blackfriar Bridge connects the cities of Salford (on the right) and Manchester, and was opened to traffic on 1 August 1820 thanks to the efforts of Thomas Fleming . It was designed by the Salford architect, Thomas Wright. 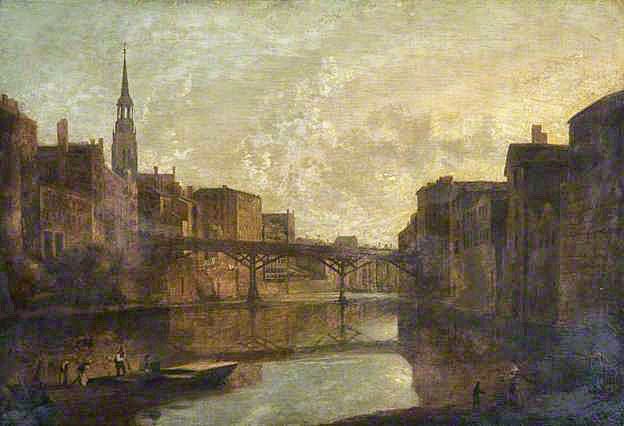 "The erection of this light and elegant bridge in a line with the principal street of Manchester and forming a spacious communication with Salford was a long desired improvement to the town The bed of the river Irwell which it crosses is here very narrow and liable to floods which rise suddenly and to a great height these sometimes made the former bridge impassable it was of wood and for foot passengers only [see below]. Our view of the present finely proportioned structure is taken from the old or Salford Bridge a little higher up on the same river The road is carried strait over three semicircular arches the two piers adorned with coupled Ionic columns and an entablature crowned with a handsome balustrade. The wooden footbridge was erected in 1761, the coronation year of James II. The bridge sloped downward from the Manchester side to the level of the Salford bank of the Irwell. It was demolished in 1817. 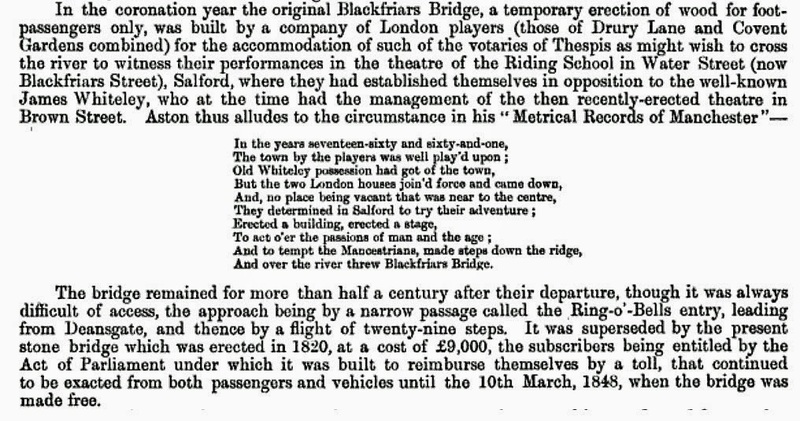 Of course, Ralston's pictorial record of the old bridge predates this event. The Landscape Album; or, Great Britain Illustrated: containing fifty-nine views by W. Westall, Esq. ARA. With descriptions of the scenery by Thomas Moule, Esq. Second series. London: Charles Tilt, 1834. Although born in Scotland in 1789, John Ralston is nowadays a little known Manchester-based artist who was much celebrated in the early 1800s. 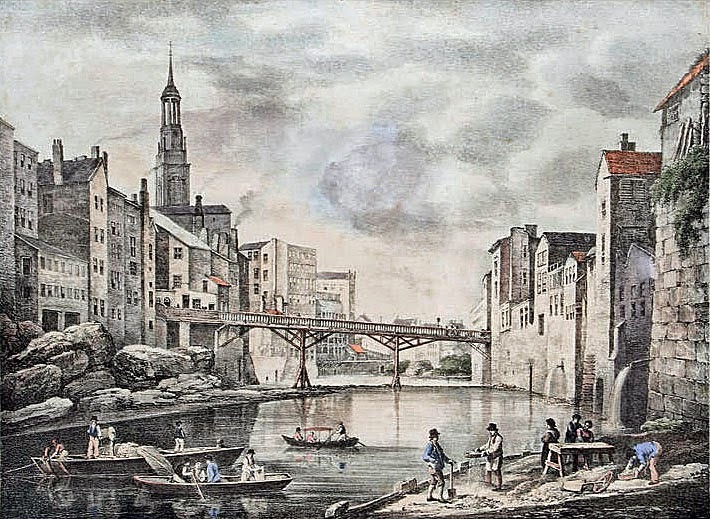 Some of our best records of late 18th and early 19th century Manchester rely on drawings made by Ralston, including his many studies of Market Sted Lane (now Market Street), Dr White's house in King Street as well as views of Blackfriars Bridge. Ralston also made an extensive record of the people of Manchester, offering a first hand insight into ladies and gentlemen's fashions of the period. Details of his life are very scant, other than a few records of his being the son of a calico printer's engraver, and that his family moved to live in Strines (near Marple) in Derbyshire. At the age of 17 he became a student at Manchester School of Art, under various tutors including Parry and Rathbone. For much of his adult life he lived at number 26 Brazennose Street near Manchester Town Hall. Apart from the smarter buildings of Manchester, he was also attracted to make drawings of inner city dereliction and slum dwellings. He was also an accomplished violinist and helped found the orchestra of the Manchester Gentlemen's Concert. A poor businessman, and much forgotten in later life, he died in poverty [in the workhouse], aged 44 in 1833. Obit. See The Victorian Web for his statue in Manchester Cathedral. The architect of the new Blackfriars Bridge, Thomas Wright, also designed Christ Church, Salford. British. BA (Modern History), MA (Ancient History), Dip.Archaeolgy (Oxford), D.Phil. (European Prehistory, Oxford). Retired academic.